John Robson is not your ordinary columnist, pundit, historian and documentary filmmaker. With wit and whimsy, his keynote presentations enlighten audiences by bringing a historical perspective to the financial, constitutional, foreign policy, social and aesthetic mess we are in. His talks always bring his unique perspective and wry sense of humour to so many issues of the day, from unfunded social programs to a circus sideshow parliament. He does this so the “PeopleKind” of Canada can analyse for themselves just what is going in this great country. John Robson is perhaps one of the most under rated speakers in Canada today. His political radio commentary, as well as his “Ask The Professor” and “This Day in History” video series are unparalleled in their accuracy and intellectual veracity; further he recently completed a massive and widely comprehensive documentary that brings into question the validity of… man made climate change! Could it be that John Robson is a modern day Renaissance (News) Man? John Robson, commentator-at-large with News Talk Radio 580 CFRA in Ottawa,National Post columnist and documentary filmmaker, is also an Invited Professor at the University of Ottawa. He holds a B.A. and M.A. in history from the University of Toronto and a Ph.D in American history from the University of Texas at Austin. 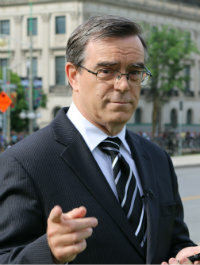 He has worked in academia, think tanks and politics as well as doing print, radio and television journalism in Canada, produced and hosted the documentary The Great War Remembered for Sun News Network in 2014 and produced and hosted the crowdfunded documentary Magna Carta: Our Shared Legacy of Liberty in 2015. He is married to Brigitte Pellerin. Have you ever found yourself knowing you had to say something about a public problem that had somehow become impossible to discuss, fenced around by politically correct taboos? Do you want to know how to speak the truth without being vilified as a bigot or driven from the stage by the shrieks of the supposedly open-minded and compassionate? In this seriously amusing talk, you’ll learn that you aren’t alone and should not be intimidated. And you’ll learn how to say what you want, without being offensive, incomprehensible or a target for persecution by environmental, feminist, campus or other thought police. Taming Leviathan: How to Put the Government Back in its Box.